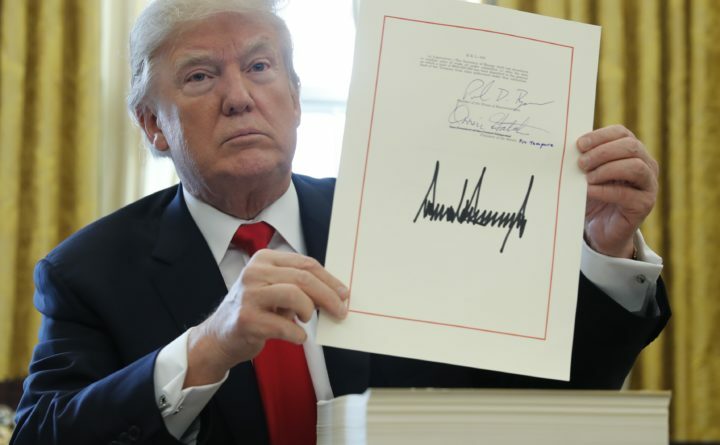 President Donald Trump displays his signature after signing the $1.5 trillion tax overhaul plan in the Oval Office of the White House in Washington, Dec. 22, 2017. WASHINGTON — It’s a Christmas gift the middle class might want to give back in a few years. The Republican tax overhaul bestows an initial infusion of cash on nearly every taxpayer next year. That extra income is likely to please millions of households, support consumer spending and perhaps give the economy a short-term lift. Ordinary households should enjoy it while it lasts. Over the next several years, multiple analyses of the law have found, those tax cuts will gradually fade — and then morph into tax hikes for a majority of people who are solidly middle class. Two features in the law — a child tax credit and a $10,000 limit on state and local tax deductions — won’t adjust to keep pace with inflation, thereby reducing their value each year. What’s more, the individual tax cuts are set to expire after 2025. And once the individual tax rates revert to their former levels, a stingier inflation gauge would raise taxes for most households. President Donald Trump has largely sidestepped these trade-offs in promoting the overhaul he signed on Friday, a measure whose benefits largely favor corporations and wealthy individuals. Trump has also said that “whoever” is president in 2025 would ensure that the expiring tax cuts for individuals are renewed. But doing so would come with a heavy cost: The national debt would likely balloon by over $2 trillion — far more than the $1.5 trillion increase that lawmakers approved for the tax cuts — according to an analysis by the Committee for a Responsible Federal Budget. The rising debt could eventually force spending cuts to social and educational programs that serve many who aspire to join the middle class. Trump and House Speaker Paul Ryan have both raised the prospect of reducing spending on social services next year, with Ryan specifically mentioning changes to Medicare. Trump, Republican lawmakers and their allies are betting that higher take-home pay from the tax cuts will shore up public support for a law that poll show a sizable number of Americans view unfavorably. They also appear confident that ordinary Americans will have no objection if corporations and the wealthy receive the bulk of the tax-cut gains so long as middle class households, on average, also receive some benefits. More than 80 percent of taxpayers will receive a tax cut in 2018, according to an analysis by the nonpartisan Tax Policy Center. These tax cuts skew most heavily toward the top 5 percent of earners. This group — with incomes starting at $307,900 — would collect 42.6 percent of the tax cuts. By 2027, they would enjoy no less than 99.2 percent of the tax cuts. By contrast, a majority of people earning less than $93,200 would, on average, absorb a tax increase in 2027. One reason that the tax overhaul favors the wealthy is how it would account for inflation. The current $1,000 child tax credit would double to $2,000. The credit would remain at $2,000 for eight years, without any adjustment for inflation, before reverting back to $1,000. Some policy advocates note that the child credit wasn’t previously adjusted for inflation. But the expanded child credit helps offset the law’s elimination of personal exemptions for children and parents that until now has reduced taxable income. Personal exemptions have been increased yearly to account for inflation — a benefit that will now end. Nor would the $10,000 cap on deducting state and local taxes adjust for inflation. If the cap were adjusted for inflation at 2 percent, for example, it would likely have reached above $11,700 in 2025 rather than remain at $10,000. Another factor in the likelihood of tax increases after 2025 is that the government would adopt a less generous measure of inflation. Rather than apply the traditional consumer price index as it now does, the IRS will start revising levels of taxable income with a measure that aims to anticipate consumer behavior: It assumes that people will limit the inflation in their daily lives by replacing costlier products with cheaper ones. But over time, this inflation gauge tends to understate inflation and would impose higher taxes on individuals. Lily Batchelder, a law professor at New York University and former Obama White House adviser, argues that the inflation gauge is being changed to help finance the measure’s corporate tax cuts, which the overhaul makes permanent. Supporters of the tax overhaul counter that Americans will look past the fine print and judge the changes based on their own individual incomes, the likelihood of pay raises resulting from corporate tax cuts and the health of the economy. “Americans right now are skeptical, really, of anything that comes out of Washington — you’ve got to prove it to them,” said Tim Phillips, president of Americans for Prosperity, a group backed by the Koch Brothers network of donors that helped campaign for the overhaul. Phillips said he thinks middle-class households will embrace the tax code rewrite if their incomes start to climb and economic growth surges. “What Americans will focus on is whether or not this tax cut actually makes them more prosperous and makes the country more prosperous,” he said.